"Teaching Children How To Live And Equipping Them For Success"
Kindergarteners enjoy an activity-oriented learning environment. Teachers concentrate on reading (with a phonetic approach), writing, and arithmetic; students will learn how to read before they graduate from kindergarten. 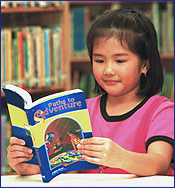 Phonics mastery is the cornerstone of the reading program, while strong foundations are carefully laid in mathematics, grammar, spelling, science, penmanship, history, and geography. At a time of physical and emotional transition, young men and women must be made to realize their personal accountability to Christ. The junior high program offers leadership, guidance, and challenging academics to develop the students confidence and stability. The senior high offers a college preparatory education in a Christian environment. Over 90 percent of our graduates continue their education in colleges and universities. The clear teaching of the Bible is the foundation for all other learning. Since the Bible is the most important subject in the Christian school, it should be taught specifically and systematically. The A Beka Book Bible Program presents the Bible in the narrative style in which it is written. The stories of the Old and New Testaments in the lower grades lead up to a presentation of the profound truths of the Gospels, the Epistles, and the other portions of Scripture for older students. The lessons flow from the Word of God, through the heart of the teacher, to the heart of the student. The curriculum has been planned so that students going through the A Beka Book Bible Program will become thoroughly acquainted with the basic portions of the Scriptures. Students need a realistic view of history, government, geography, and economics based upon the foundational truths of the Scriptures. Ever since H. G. Wells published his Outline of History in 1920, the theme of world history texts has been man's supposed progress from savagery toward socialism, from tribal religions toward one-world government. American history is usually presented as a series of conflicts-rich vs. poor, black vs. white, North vs. South, labor vs. management, male vs. female, etc. Our A Beka Book texts reject the Marxist/Hegelian conflict theory of history in favor of a truthful portrayal of peoples, lands, religions, ideals, heroes, triumphs, and setbacks. The result has been positive, uplifting history texts that give students an historical perspective and instill within them an intelligent pride for their own country and a desire to help it back to its traditional values. We present government as ordained by God for the maintenance of law and order, not as a cure-all for the problems of humanity. We present free-enterprise economics without apology and point out the dangers of Communism, socialism, and liberalism to the well-being of people across the globe. In short, A Beka Book offers you a Christian and conservative approach to the study of what man has done with the time God has given. Mathematics is the language God used in His creation of the universe, and thus it is logical, orderly, beautiful, and very practical in science and in daily life. No subject matter better reflects the glory of God than mathematics. To study mathematics is to study God's thoughts after Him, for He is the great Engineer and Architect of the universe. Unlike the “modern math” theorists, who believe that mathematics is a creation of man and thus arbitrary and relative, we believe that the laws of mathematics are a creation of God and thus absolute. All of the laws of mathematics are God's laws. Our knowledge of God's absolute mathematical laws may be incomplete or at times in error, but that merely shows human frailty, not relativity in mathematics. Man's task is to search out and make use of the laws of the universe, both scientific and mathematical. A Beka Book provides attractive, legible, workable traditional mathematics texts that are not burdened with modern theories such as set theory. These books have been field-tested, revised, and used successfully for many years in Christian schools. They are classics with up-to-date appeal. Besides training students in the basic skills that they will need all their lives, the A Beka Book traditional mathematics books teach students to believe in the absolutes of the universe, to work diligently to get right answers, and to see the facts of mathematics as part of the truth and order that God has built into the real universe. Science is the study of God's order, provision, and reasonableness as revealed in His physical creation. While secular science textbooks present modern science as the opposite of faith, the A Beka Book science texts teach that modern science is the product of Western man's return to the Scriptures after the Protestant Reformation, leading to his desire to understand and subdue the earth, which he saw as the orderly, law-abiding creation of the God of the Bible. The A Beka Book Science and Health Program presents the universe as the direct creation of God and refutes the man-made idea of evolution. Further, the books present God as the Great Designer and Lawgiver, without Whom the evident design and laws of nature would be inexplicable. They give a solid foundation in all areas of science -- a foundation firmly anchored to Scriptural truth. Teachability is assured through accurate, interesting writing, carefully planned demonstrations that can be performed with a minimum of equipment, chapter terms and questions, full-color illustrations, consideration of the interests and comprehension skills of students at each grade level, and detailed Curriculum / Lesson Plans. Because God has given us the great commission of communicating His truth to mankind, we must give our students the finest tools available to carry out this goal in a reasonable, well-articulated manner. God gave us our powers of thought and language and chose to reveal His will and His ways to us in a written form, the Bible; thus we need to pay particular attention to the teaching of grammar, spelling, vocabulary, composition, and literature as we seek to educate students from a Christian perspective. Since Darwin, linguists have sought in vain for a credible explanation for the origin of language. Having accepted evolutionary philosophy, they can only think that language must be simply a response to a stimulus, an emotional outcry, an imitation of animals. If such foolishness were true, then any talk of language being governed by rules or any claims that some expressions are better than others would be inappropriate, and relativism would rule. This explains many English programs today. But as Christians, we still believe that the Bible provides the only credible explanation for the universe, of man, and of language. Therefore, it is easy to see in language a structure which reflects the logic, reasonableness, and orderliness of the One who created man and his language. On this basis, we believe that there are standards for man to adhere to in language as in all of life. This is why our A Beka Book grammar books emphasize structure, rules, analysis, and the kind of practice that aims at mastery. This is why we place an importance on correct spelling and the continual enlargement of each student's vocabulary. This is why we aspire to provide students with examples of the very best literature of the ages, and this is why we emphasize the continual improvement of writing abilities. Grace Baptist Academy uses the IGNITIA Digital Curriculum, which is a full-line curriculum, including all core curriculum subjects: Bible, English & Spelling, History/Geography, Literature, Math, and Science. This educationally sound and Biblically true program has proven itself in hundreds of Christian day schools throughout America, Canada and in several foreign countries. You will find numerous examples of Bible memory work throughout the curriculum. Please note that the verses to be memorized are usually related to the material being studied. The purpose is to help the students relate God's Word to the subject content. Scripture used in Landmark's Freedom Baptist Curriculum is only from the Authorized King James Bible (KJV), which God has preserved for the English-speaking world. Our curriculum introduces the students to a new concept, then repeats the same concept from a broader base at a later time in the course. This planned repetition and expansion of a concept is a proven mastery technique used in the most sophisticated learning tools available. In English and math, concepts are repeated from year to year to ensure mastery of these important skill areas. Christians must be able to communicate effectively whether they are preachers, lawyers, salesmen, writers or clerks. They must be able to tell the "old story" in a convincing manner that will result in changed lives since many of them will become Sunday school teachers, preachers, bus workers and personal witnesses. The curriculum places a heavy emphasis upon writing and speaking, with the emphasis becoming greater in the upper grades. Grace Baptist Academy recognizes the need for social interaction and the curriculum used is designed to accomplish this aim. Projects such as interviews, observations and outside research provide opportunities for students at Grace Baptist Academy to combine academics with social activity. Grace Baptist Academy maintains that while academic knowledge and skills are important, character development is vital. Most students eventually will learn to do math, but if they are deficient in morals and principles, their whole lives will be affected aversely. It is more important to be honest and dependable than to be able to explain the Pythagorean Theorem or to be an expert on the Middle Ages. We challenge students to become people with character and ability, but we teach that character is more important. Kindness, generosity, fairness, love, helpfulness, respect and obedience are traits that are interwoven throughout the LFBC material. Grace Baptist Academy has taken the position that Christian young people should be exposed to the great literature of the past. This is done, not as a weak part of the English program, but as a separate program in itself. After reading a great story, the student often memorizes a Bible verse that is applicable to the truth taught in the story. Your child deserves a Christian Education!